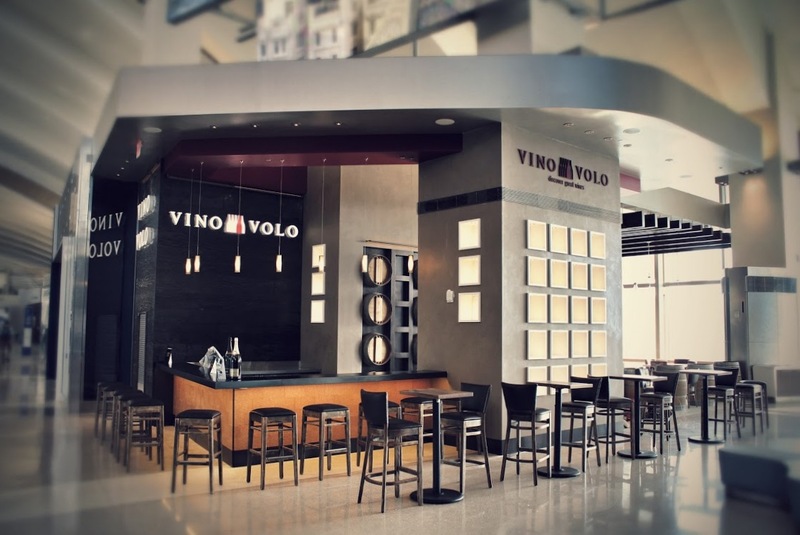 Vino Volo LAX is the latest edition of Vino Volo’s successful line of upscale airport wine bars. This high-profile location is a prominent feature within the impressive new LAX Tom Bradley International Terminal and provides a sophisticated retreat where travelers can discover hand selected wines from California and around the world. The architectural intent was to reinterpret a modern California winery aesthetic to fit into the context of the new terminal’s inspiring and dynamic design, while remaining true to the comfortable elegance so prominent in winery tasting rooms. It is a composition of natural materials reflecting the spirit of the wine making world: oak, stone, industrial metals, leather and cork, all derived from nature and locally sourced for the project. These materials are then deconstructed and abstracted in order to define the different areas of the space. The seating area is a play on a trellised patio one might find at a Napa winery–using abstracted components resembling large oak wine barrel staves, and the bar area features a raw steel counter accented with cork paneling. The end result is welcoming and cozy, a momentary respite for the weary traveler to find, share and enjoy great wine.